Tonight's run has pulled back on the lowland snow (see graphic for 24-h snow ending 4 PM). I wanted all of you to see how even this close in forecasts can vary when the atmosphere is on the edge (in this case rain versus snow). One thing that hasn't changed is the snow in the mountains...they are going to get hit very, very hard, with 2-3 feet in places. Note that the snow level is very low....some wet snow on the higher hills and if you are above 700-1000 ft be prepared for lots of white stuff. Bigger threat south of the city as this band of very heavy precipitation gets established after 1 AM. Folks...I don't want to cry wolf about this...but if you take the current model output literally, we will have a significant lowland snow event after midnight tonight. What gets me nervous is that my colleagues in the National Weather Service are not mentioning the possibility at all in their forecast or discussion. Here is the 24-h snowfall map for the period ending 4PM Monday. Wow. 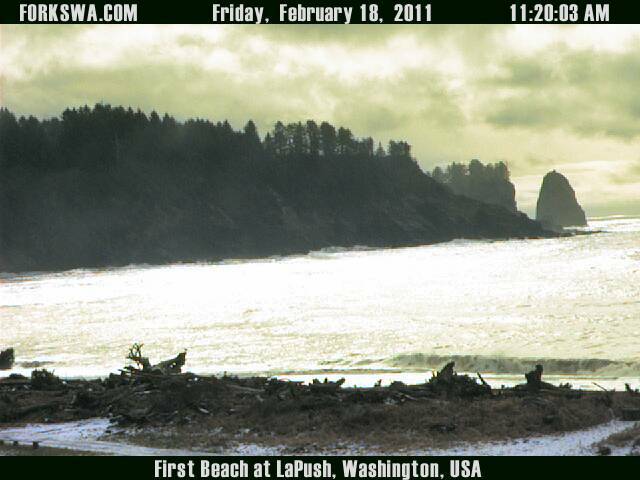 The mountains get 2-3 feet of snow and the Puget Sound and SW WA lowlands get several inches. There would be precipitation shadowing west and north of Seattle. I should also note that the Weather Channel automated system is also going for early morning snow. The previous run has only scattered, light snow showers. Here it is. So we don't have run to run consistently...which tells us that there is real uncertainty here. The temperatures are marginal for snow later this evening, but the last model run suggests that a heavy precipitation rate will drive the snow level down to sea level in many locations. This kind of situation is called a diabatic snow event...since the melting of snow is an important source of the cool (diabatic is term for such an effect). A tricky forecast since it depends on getting the intensity of the precipitation correct...something we are not that good at. YES, there is uncertainty with this event. If the last run is wrong and the precipitation is lighter all the lowlands will get is rain. Anyway, just be aware of the possibility. If this happens the commute tomorrow will be a zoo. If tonight's run has it, I would be prepared. Want more weather fun? The models have a major windstorm coming in on Wednesday. And there was snow today in Los Angeles and several inches around Tucson. You've heard of the Bermuda Triangle. Perhaps the Dragon's Triangle of the Pacific. But there is another mystery of science...the Olympia Cold Anomaly. Its amazing and beyond our understanding. For some reason on cold, clear nights Olympia Airport is often the coldest location in western Washington...often by far. Last night Olympia dropped to startling 5F. You heard right, five degrees above zero. It was the all time record low for the date at that site. 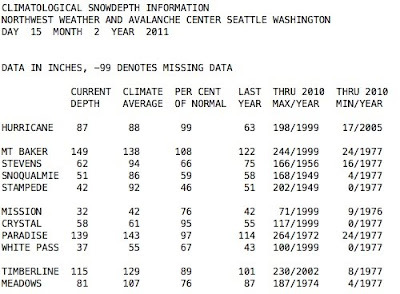 At the same time most of the rest of western Washington only dropped into the lower twenties to mid teens. To illustrate, here are the regional weather observations at 7 AM (click to expand): Near the water, temps only dropped into the mid 20s; move more than a few miles inland and the teens were prevalent. Lets do some more investigation--here is a close-in plot at the temperatures at the same time (7 AM Friday) around Olympia: Olympia Airport is the coldest (8F), but nearby East Olympia is close (10F). OK, Olympia Airport is away from Puget Sound a bit..that is good for being cool, but why so horribly frigid? Could it be a topographic reason? For example, a location in a terrain bowlis often a cold spot, since the coldest air settles to the lowest elevations. Here are two topographic maps--one pulled back and one close in. Olympia Airport does seem to be in a relatively low spot with surrounding higher terrain. But I have seen more impressive terrain low spots. I should also note that the observing equipment at the Olympia Airport is the best....a NWS/FAA ASOS station--the gold standard and carefully calibrated. Are there other possibilities of why this location is so special? I simply don't know. By the way the Olympia cold temperature last night was almost equaled by a location in Skagit County..the Sakuma Farm AgWeatherNet site with a temperature of 5.6F. They probably grow ice lettuce there! It is important to note that snow contributed to the general low temperatures last night for much of the region. Snow is a cold factory. It reflects solar radiation during the day and is a very effective emitter of infrared radiation both night and day. Snow is also a good insulator and prevents heat from the warm soil below (when the soil is warm, of course) from reaching the lower atmosphere. The cold records are almost always when snow is on the ground. And talking about snow...here is a NASA MODIS image of the region today. Although some snow melted today, the snow is still pretty clearcut, as is the lack of snow over the Kitsap and the north side of Seattle. 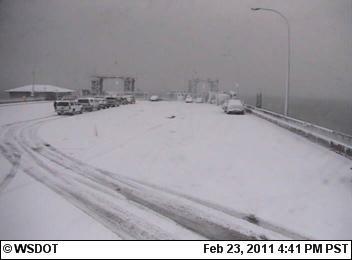 And Bellingham. You see the band of clouds over the ocean stretching NE to SW? I bet you won't guess what that is.... a convergence zone to the lee of the Olympics. With flow from the NE, the air split around the Olympics on the NE side and then converges together on the SW side. Converging airstreams produce upward motion and clouds Pretty weird! The airport is called Bush Prairie after Tumwater pioneer, George W. Bush. He had a large farm there 160 years ago because that is sandy loam soils; very sandy soils. 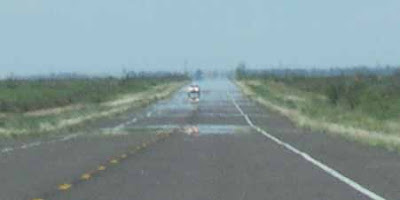 I recall visiting the westside of the runways in 1990 after a 30 hour period of 5 inches of rain. At the time I was prospecting for new youth soccer fields, but I was amazed that I could find no standing water. The Soil Conservation Service calls it Nisqually Sand formation (as I recall) now with fine sand even at 60 inches. We have two areas that soil type locally. The other is Chambers Prairie; in and south of Lacey toward WSU’s AgWeather site near East Olympia. This is a very important point. Sandy soils are often associated with low temperatures because their low water content does not conduct heat well. But.... there was snow of the ground, which should have insulated the air from the ground temperatures. So perhaps the mystery continues. But...the soil temperature WOULD help explain part of the anomaly when snow is not on the ground...which is most of the time. 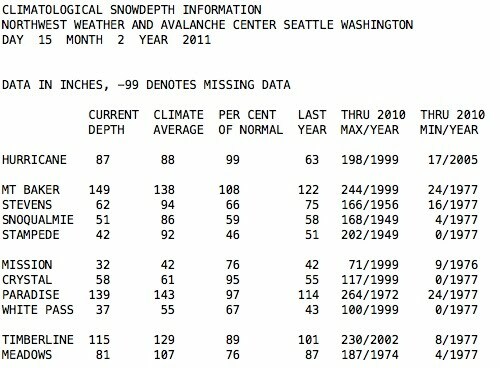 I should also note that Olympia has some of the HIGHEST maximum temperatures in summer. The sandy soils could be contributing to that, as the lack of marine influence. One final note: I have an op-ed piece on the math standards issue in the Seattle Times today if anyone is interested. We will dump our current math standards if the legislature doesn't act this session. There have been some complaints about the recent snow forecasts in some quarters. The Seattle Times will run a story tomorrow "Forecasts for Snowfall in Seattle Goes Cold", several of you have commented about poor snow forecasting of this event, and even one prominent local TV weathercaster noted that sometimes he has to admit to making a mistake (about the snow over Seattle) and then proceeded to blame it on the models (and showed the UW model output for good measure!). Let me give you my take on this. Before we evaluate the forecast, what actually happened. Well, the region did get snow and some locations a lot of it. Based on the official National Weather Service numbers, the heaviest snow (up to .5 to 1.5 feet) fell in a line stretching from Skagit County across Whidbey Island out to Victoria. On the northern Olympic Peninsula Sequim had 4.5 inches,Port Townsend 5 inches, and Port Angeles a bit over 9. Snow decreased toward Bellingham 1.5 inches and southward to Marysville (3 in) and Everett (4.5 inches). The immediate Seattle urban area had roughly .5 to 1.5 inches, with snowfall rapidly increasing to 3-9 inches on the eastside. Snowfall increased south of Seattle (Kent, Auburn, Southcenter, Sea Tac) to 4-5 inches. 3-5 inches from Tacoma to Olympia. Very little snow over the southern Kitsap Peninsula. So it snowed, and in many areas it was appreciable. I5 was closed for a while near Mt. Vernon and crippled near Sea Tac last night. Let us consider how the UW WRF model did, since this is important guidance to both the National Weather Service, local TV folks, and yes, even me. Let me show you the 24h predicted snowfall for the period ending 4 AM this morning for several model runs starting days ago. Let see how consistent the 4-km resolution model guidance was and how it changed in time. You be the judge! Here is the forecast initialized (started) at 4 AM on Monday. Note the lack of snow over Seattle and the Kitsap (due to rainshadowing off the Olympics). 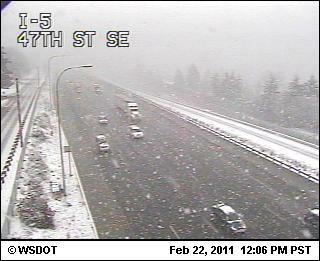 Heavier snow north of Everett and over the N. sides of the Olympics. 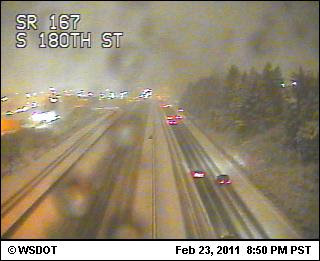 Moderate snow over the eastside communities and heavy snow over the mountains. NOT BAD!. In the forecast begun 4 AM on Tuesday, the Bellingham snow threat has declined. 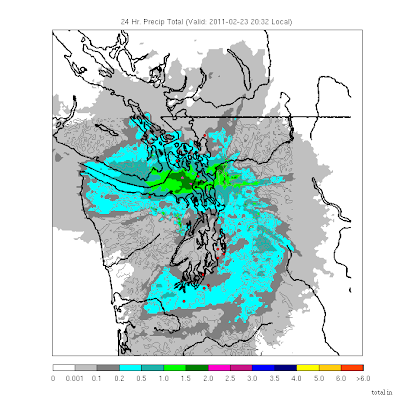 The Skagit snow band was there, the Kitsap-Seattle dry band is there but weakened. But too much snow was evident over North Seattle. 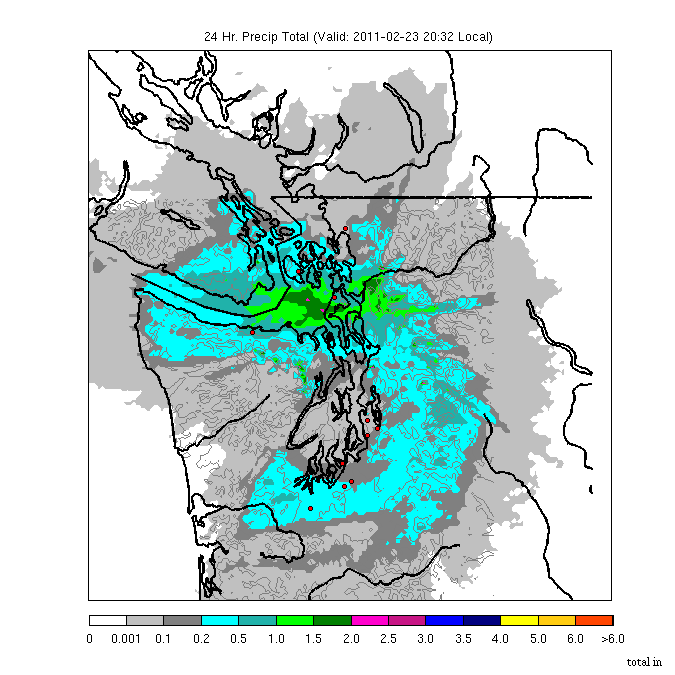 Twelve hours later a distinct snow band was positioned over Seattle. Clearly, not right. And here is the forecast from 4 AM Wednesday morning. The Seattle snow band had weakened and heavier precipitation had moved north. Better, but not perfect, of course. Now there are a few things you should take away from this. First, the model (and the others the NWS and I were looking at) was serious about snow; although the snow distributions changed from run to run, they all indicated a serious threat. Second, they all agreed the mountains would be hit hard...and they were. Most of them showed a lessening of precipitation over the Kitsap and southern Seattle, and substantial snow over the eastern suburbs. Most indicated enhanced snow in some kind of east-west band, but the position varied. This was a crucial point....it was clear that the greatest threat was in a zone of convergence between northeasterly coming from the Fraser River Valley (and surrounding low terrain) and southerly flow moving up the Sound. But there was NOT agreement exactly where this would be. There was uncertainty for this feature. It also turned out there was uncertainty about where the low pressure center controlling a lot of this action would be positioned. To get this prediction right the forecast had to simulate all the following correctly: the downslope off the Olympics , the flow through the Fraser Gap , the position and intensity of the low , and upper level trough approaching the region, among other features. All interacting in a very non-linear way. And it was worse than that. Most of the showers were from convection--isolated snow shower that are very much hit and miss. It was clear there would be a lot of banding and variability in the snowfall. Folks, getting all this right is beyond our technology and science. So was this forecast a failure? I don't think so. Even though we did not have confidence where that intense snow band would set up, we could tell you it could set up somewhere resulting in very heavy amounts. 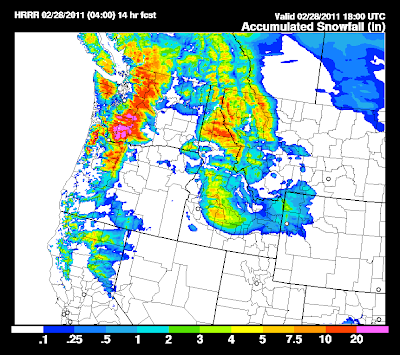 We could tell you the mountains would get large amounts and that serious snow would hit the eastside. We could tell you about the rainshadowing over Kitsap and Seattle as being a probable element. And the snow on the north side of the Olympics. We gave a modest snow range over Seattle (roughly 1-6 inches depending on whose forecast you looked at) to cover the uncertainty. Will we eventually do better than this? You bet...and we are working on a technology at the UW (called Ensemble Kalman Filter data assimilation) that might do so, but this is a few years off. And the new coastal radar will paint out the critical flow structures offshore that we can't see now. This snow forecast is a vast improvement on what we could have done only a few years ago. And a critical issue it reveals is the necessity for my profession to learn how to effectively communicate the uncertainties in our forecast. To paraphrase an erstwhile Secretary of Defense: we need to tell you about the known unknowns. And in a future blog I will discuss the shameless and occasionally irresponsible hyping of this event by a few media outlets, including their breathless description of sudden icing that supposedly would befall yesterday's commute...just like Nov. 22nd! Complete nonsense. Folks...the big threat for central Puget Sound...the one suggested by the model's last night is coming up now. So far things have gone pretty much on track.... we started with rainshadowing over Seattle and the southern Sound. The as the flow turned more southwesterly the rainshadow shifted northward and the southern Sound had increased snow showers. As the northerly wind picked up a convergence line developed over NW Washington the brought snow to the San Juans to Skagit County...and then the northern Olympic Peninsula (here is a shot from Port Townsend to illustrate. The radar is showing the impact---moderate echos are now moving toward Everett and down the Sound. (see radar). If the line continues to push southward, the battleground between the two air masses could be fierce and significant snow the result. Temperatures are relatively mild from a day's worth of heating, but melting of precipitation and the ingestion of cool, dry air from the north should help it turn to snow. I think Seattle commuters will be fine....the roads are warm and salted (sound likes a good meal! )...but tonight could get very interesting very fast if this boundary locks over someone. Watch the radar now...if will be very entertaining! Here is the story at 6 AM. The commute for Seattle and to its west should be uneventful. The winds aloft are still westerly aloft that we are in the rainshadow of the Olympics and that should not change much before 8 AM. As normal for rainshadow, precipitation picks up in the eastern suburbs east of Lake Sammamish. Snow showers are moving into the region, but as seen in the radar most of the action is north of Everett and south of Bellingham. 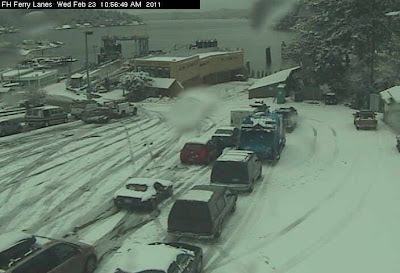 So Whidbey Island, the San Juans, and the northern Olympics are seeing snow showers now, some occasionally heavy. In fact, you will notice the heaviest precipitation is over the eastern Strait and westward and that is probably due to the convergence of modest NE flow coming out of the Fraser and southerly wind coming up the Sound and westerly wind moving eastward in the Strait (see map below). Such low level convergence forces upward motion. WATCH THAT BOUNDARY--that is where the big action will be today. 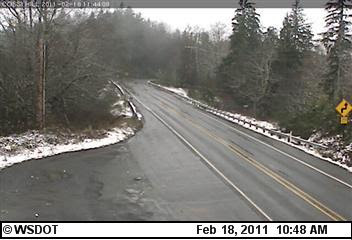 Go south of McChord and there are snow showers moving through the Chehalis Gap. 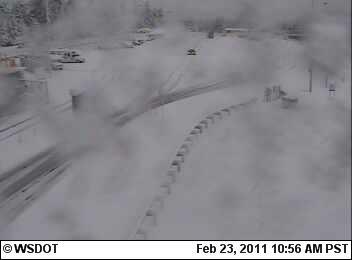 Moderate to heavy snow on the western slopes of the Cascades and foothills. So bottom line for Seattle commuters...you will have no problem getting into work. Temperatures are above freezing and road surfaces are wet. Looking at the satellite pictures (see below) I am not impressed with what is coming in from offshore. Not much cooling of the cloud tops (such cooling means deepening of the clouds and intensification). The models indicate that during the day the flow approaching the region will weaken and turn more southerly....that will open Seattle to snow showers, and as the low moves south, northerly flow will push southward. But not yet. Last night the NWS was going for a hard freeze of this stuff later today during the commute home. Looking at the situation now I believe that is highly unlikely. Temperatures will remain at or slightly above freezing during the day. Major urban roads should be ok, particularly since many DOT's applied deicers. The only failure mode would be if the snow rate gets SO large that we get a slippery slush layer after the deicers get diluted. Reminder...my talk at Ivar's Mukilteo has been delayed to March 9 due to snow forecast. It will not be good if it doesn't snow! Folks...this is serious. So serious that Ivar's is canceling my presentation tomorrow night at their Mukilteo Landing Restaurant....looks like we will try March 9th. There has been plenty of snow already in the convergence zone.....here is a recent radar image, See the band with green in the middle...that is the convergence zone. I have taken a look at the latest model runs this morning and they are amazingly consistent both in time and among the models. Although this give me confidence in their forecast, there is still uncertainty in exact positions of features and snow accumulations. Here is the 24-h snowfall ending 4 AM on Thursday: There are a lot of subtlies in play here. First, the snow will be very banded, which means there will be a lot of horizontal structure (spatial variations in snowfall between neighboring locations). Second, for the early part of the period there will be significant rainshadowing (snow shadowing) off the Olympics under northwesterly flow...which means Kitsap and south Sound will have snow reduced. Third, a LOT of the action will be at the boundary between NE flow moving out of the Fraser and vicinity and southerly flow moving up the Sound. The southerly flow will be forced to rise by the cold, dense northerlies--producing enhanced precipitation (snow). That is why you see the heavy band between Seattle and Bellingham. No guarantees EXACTLY where that interface will lie. Upslope flow on the Olympics should produce heavy snow on the northern Olympic slopes. And on Thursday, eastern Washington will get crushed by very strong northerly winds and extraordinarily cold temperatures (single digits and below zero). So bottom line for snow. My prediction: South Seatttle--1-3 inches, North Seattle--2-5 inches, northern Snohomish (3-8 inches). Good news for commuters and SDOT tomorrow: temperatures will remain above freezing, SO NO SOLID ICE LAYER like Nov 22, 2010. I am planning to try another NOWCASTING experiment tomorrow (Wednesday). Frequent updates throughout the day on what is happening and will happen during the next few hours. Finally, I would like to thank those that have contributed to the development of our local forecasting capability (upper right of this blog for more info)... I have already used some of the funds to replace some aging hardware. PS: I am looking for video of Jim Forman if anyone has it or recording him tonight! Update 7:15 PM--the convergence zone has formed and I can hear ice pellets on my window! I am going to go out on a limb now...I think most of you ...even those in the lowlands ...will see some snow before the week is up. And much colder temperatures. Colder air will move in behind the front, causing the atmosphere to be less stable (more convective showers) , and there is a good chance of a convergence zone over Puget Sound forming tonight and tomorrow morning behind it. The freezing level will be low enough that if the CZ has sufficiently intense precipitation, wet snow could reach sea level with the zone. So don't be shocked by some flakes during the next 18h or so. This system will SURELY bring snow to the mountains...in fact, enough to improve the skiing a bit (6-12 inches). I was skiing in the pass on Sunday and lets say it needed to be freshened up a bit. Here is the 24-h snow ending 4 PM Tuesday. And yes, it is showing some snow over the eastern Puget Sound lowlands...places a high elevations and away from the water. But this is just a warm up (really just the opposite!!). The air will get colder on Tuesday into Wednesday and then an upper level trough will move towards us from the north (see map). This is close to a classic upper air snow configuration. Not quite perfect (little too much extension over the Pacific), but close enough. And by the time we get to Wednesday we won't have to worry about being cold enough to snow. Associated with this upper trough will be a low pressure center that will form in the lee (south) of Vancouver Islands. (map). The real primo cold air will be locked in the interior of BC, blocked by the mountains. Virtually all the models are on board with this solution--enough that I think it has a good chance of it happening (YES, there is always uncertainty in a forecast). Virtually all indicate strong NE winds will exit the Fraser starting on Wednesday...and then it gets interesting and more uncertain. There is little doubt that there will be some snow showers with this system, but serious snow demands more. If the low remains offshore of the north WA coast the easterlies will move down the Strait and some of them will plow into the Olympics, hitting the north Olympic communities with snow. Those retired folks will have to switch from golf to x-country skiing for a while! If the low moves southward, then southerlies moving up the Sound could plow right into them, give decent lowland snow over the Sound. In any case, there will be an interface between the northeasterlies and southerlies that will produce a significant snowfall somewhere, most probably over NW Washington. You can see the heavier snow associated with the interface--stretching across Whidbey Island to the north Olympic peninsula. I was looking forward to giving my talk at Ivar's on Wednesday evening....so I hope the snow does its typical mirage act.... But the bottom line is that exciting things are possible during the next 48-h..so be prepared. I know Jim Forman is. Well, we have had a wintertime mirage the past few weeks..the Snow Mirage. Home many times--3, 5, 7 days out--the models suggest a major cold spell with the flow amenable to snow. And then as we get closer it falls apart, often due to a trough moving westward of the initially forecast position. The model forecasts for next Wednesday and Thursday would warm the heart of a polar bear. You want a high amplitude trough, well positioned to bring in cold air....you got it. Look at this pressure and pressure forecast for Thursday...megacold and a huge pressure gradient over us. Bellingham would be blown away with NE winds. 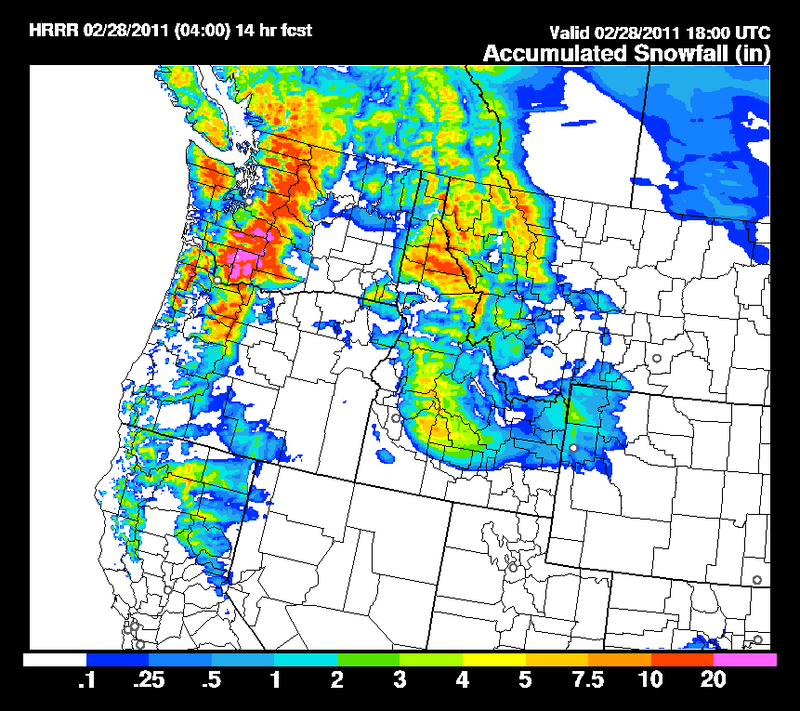 Model forecast of lowland snow? You bet. The only negative for those of us in central Puget Sound is that rain (snow) shadowing evident in the above forecast...but who knows about the details? Well, I won't tease anymore....and I won't get too excited about this until Monday. Still there then and the European Center model is on board, I will head out to get a new parka...I will need it. Forecasting snow over the western Washington and Oregon lowlands is a subtle game. To get snow, everything needs to set up right...and as I have noted before, it is easy for us to be mild and wet or cold and dry, but to be cold and wet takes some doing around here. The models on Monday looked like we had a significant shot at lowland snow, particularly above a few hundred feet and away from the water. But the trend of the recent runs has been a westward shift of a key feature--a trough coming out of the north--which could leave us with too little moisture. Spot the differences? Much more energy offshore (stronger trough, stronger flow) in the latest run and that makes all the difference. This subtle shift results in most of the precipitation and falling pressure offshore. There could be a few showers reaching the western lowlands, but they will be scattered and only higher hills have a chance of getting some snow showers. Better chance for light snow on the coast. As the trough moves offshore and south of us the skies will clear and the second part of Friday and Saturday should be dry. All kinds of interesting possibilities for Sunday...(yes even snow)...but that will await another blog. The higher volcanic peaks are doing ok (Timberline, Mt. Baker, Paradise), but the lower passes, especially in the middle Cascades are way below normal. Not the bountiful snow of a typical La Nina year...but it is not over yet. California is picking up plenty of mountain snow right now, which is very good for their water situation this summer. PS: Just a reminder...I will be giving a dinner-time talk at Ivar's Mukilteo Landing Restaurant at 7 PM on Wednesday Feb 23rd. The subject: the strong westerly wind surges that push down the Strait with winds approaching hurricane strength. One destroyed the restaurant in 2003. Another half-destroyed the WS Ferry Elwha in 1990. Anyway, the restaurant was rebuilt with a weather theme and they just put up a cam and weather station. If interested, you should make a reservation (see information on the right side of this blog). The destruction of the Mukileto Landing Restaurant will be the theme of this talk. Trying to get Gordon Lightfoot to pen a song.